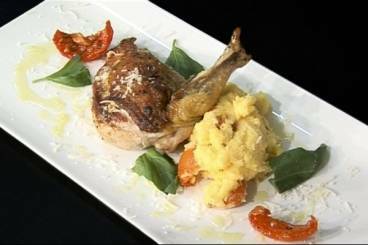 A flavoursome dish of guinea fowl breast stuffed with ricotta and fresh herbs and served with sundried tomato and parmesan polenta. Chop the sundried tomatoes into small pieces. Peel and finely chop the garlic clove. Pick and chop the basil leaves and the thyme. Mix the herbs and the garlic with the ricotta. Gently lift the skin from the guinea fowl fillet to make a 'pocket'. Fill this pocket with the cheese mixture and then gently press the the skin back down. Heat a frying pan, add a dash of olive oil and sear the guinea fowl (skin side down first) for about 2 minutes on each side over a medium heat. Remove from the pan, place on a baking tray and finish cooking in the oven for 7-9 minutes. In the meantime, cook the polenta. Bring 600ml water to the boil and add to the polenta. Keep over a gentle heat and stir frequently for 6-8 minutes until the polenta is cooked. Stir through the sundried tomatoes, a knob of butter and the parmesan cheese. Remove the guinea fowl from the oven and allow to rest a little before serving.